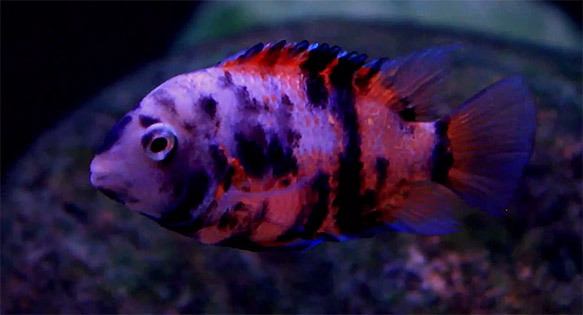 Screen Capture of an exceptionally vibrant Calico Convict Cichlid by Mbuna Marcus on YouTube. We’ll refrain from getting into the whole “designer” vs. “wild type” debate this time around. Instead, for one brief moment, let’s just appreciate the fish for what it is. BUT… what is this fish? Indeed Marcus, that’s one exceptional fish (and a really good video to). Of course, in response to Stephen Covolo-Hudson’s question, we were quick to say “Yes, we have seen a convict like this before,” just so happens that the video we responded with was Caporicci’s video of the parents! Bonus! But this is where it gets interesting to me. I’m not up on my “Convict Cichlid Genetics”, but I do have a good working knowledge of the ornamental genetics of a related species; the domestic Angelfish (Pterophyllum scalare). When that realization hit, my brain started making connections. I have seen the Calico Convict before…in what we generally know of as a “Koi” Angelfish! Is the Koi Angelfish the same thing as a Calico Convict? When you add in the second dose (creating a homozygous fish) you get a Blushing / Blusher / German Blue Angelfish. It occurred to me that I’d seen something “similar” in the Convict – the “Pink” Convict (this by candle3090)! So Pink Convicts are possibly similar to Blushing Angels. What about the black blotches in a Calico Convict? Two doses of Gold Marble give you the full on Koi like I showed above. So could the Calico Convict be a combination of genes, not unlike the Koi Angelfish? It’s also possible that the “male” in this pair might be a “Marble”, and not a “Calico”, but he seems to lack the opaqueness of the male shown above (this by muriloboeno). Then there’s this video, which shows some fish that appear to be partially marbled, partially showing the classic striping pattern of a “Black” convict (again, by Mad Cypress Aquariums). So what do we really know about Convict genetics? As I really started wading through the internet, I started finding bits and pieces of the puzzle. “Pink” in Convicts appears to be a recessive genetic mutation unlike “Stripeless” in Angelfish, which is partially-dominant. In either case though, both serve to strip away melanin patterning and production, particularly in homozygous states (where two copies of the gene are present together). Information on WikiPedia suggests that “Pink” convicts are what we’d call leucistic, and reiterates that this is caused by a recessively expressing mutation. In short, if you mate a Pink (p/p) convict to a wild type (+/+), you’ll get all wild types that are “het” for pink (+/p). All the anecdotes and reports from hobbyists who’ve made the appropriate test crosses seem to confirm the recessive nature of “Pink” in Convicts. “Marble” in Convicts ALSO appears to be potentially a recessive trait, or at the very least, it’s not straight up dominant, whereas again, in domestic Angelfish, both forms of marble (aforementioned Gold Marble and another mutation, simply Marble) are somewhat dominant in their expression. Reports seem to consistently suggest that Marble/Calico backcrosses to wild type convicts don’t produce marble offspring in the F1 generation. Furthermore, it seems that it can be difficult to really differentiate a “Marble” Convict from a “Calico”. The best I can suggest is that the fish we’d like to call and label as Marbles seem to lack the skin translucency that gives a “Pink” and a “Calico” their somewhat more peach base coloration, which makes me question whether the 2nd “Marble Convict” video simply shows a male that appears white more due to the lighting. I find the third video showing what appear to be “partial” Marble Convicts interesting too – Gold Marble Angelfish which carry only a single dose of the Gold Marble gene are called Gold Marble Silver, because they still show some of the underlying default wild-type stripe genetics which are on another locus (a codominant blending of traits). So had I really seen a “Calico Convict,” reincarnated in what we commonly call a “Koi” Angelfish? Well, it’s certainly possible. In this case, it does seem that the genetic mutations are not necessarily the same genetic mutation as seen in related species. In other words, we are not looking at something like “Albino” seen in Angelfish and Convicts and Clownfish and Guppies. However, it does seem that there is an interplay of mutiple genes creating similar end results, possibly through similar mechanisms. In reading through the anecdotal reports, I’m just going to throw out a hypothesis. Perhaps Marble and Pink are on different loci in Convicts, not unlike Gold Marble and Stripeless are in Angelfish. It could be that Marble in Convicts controls striping, but is recessive to the wild type dominant “Black” (striped) gene. Pink is known to be recessive, but pink also interferes with the expression of the wild type / dominant Black Gene (for a parallel, what we call “Silver” in Angelfish). However, Pink does not interfere with the expression of the Marble gene, that is to say a heterozygous Marble Convict (+/m) could show the single-dose gene, but only when pink, on another locus, is stripping away the ability of the wild type (+) Black gene to suppress the Marble gene. This slightly unusual way of looking at the genetics seems a plausible explanation for some of the hunches that aquarists have put forth. A second hypothesis is also possible – what if both Pink and Marble are on the same locus in convicts? This is entirely possible – Angelfish have several known traits that share a locus and interact with each other. Could it be that a (+/+) Convict is the wild / Black / striped form, a (+/m) appears the same, as does a (+/p)? That much seems to work and fit with current observations. We also know a Pink Convict is a (p/p). The unknowns? What if a Calico Convict is not (p/p – m/m), but in fact (p/m)? That would also allow for the marble to be (m/m). That scenario could explain why some feel the easiest path to a “Marbled” Convict is through the pairing of two “Calico” Convicts. This scenario might be what is going on, at least it seems to fit well with observations made by “Greg The Crazy Fish Guy” – what he might be calling out as “Light Marble” may well be the Calico (p/m) form, and his “Dark Marble” might simply be the (m/m) form. Of course, both guesses could easily be wrong, and our application of phenotype names might even be causing further confusion. Other than a few truly odd “Marble” Convicts shown above, it seems the vast majority of convicts that show marble patterning definitely have the pink mutation in their mix. Through simple observation, it seems that many aquarists simply lump the “Marble” and “Calico” convicts together as one and the same. After all, it is normally only the females in Convicts that historically developed any large amounts of orange coloration (“calico” being black, white and orange of course); could we really just be looking at a scenario where the dullest males are being seen as “marbles” and the brightest females simply being the most desirable “calicos”? There might actually not be a “Marble” (m/m) Convict out there afterall. Ultimately, the genetic mystery remains, but it does seem that the “Calico” is the mixing of two distinct alleles (genes); we have Pink Convicts with no marbling, and Pink Convicts that most certainly have marbling. It does seem that there is an ability of the Marble to amplify the orange coloration in what we call a Calico, and this was exactly the same thing we saw happen with our Koi Angelfish – Gold Marble in conjunction with Stripeless, in the extreme, pushes out the orange coloration in a Koi Angel. After that, we’re looking simply at selective breeding which amplifies the amount of orange coloration being seen. Since we cannot easily see the divisions between varying levels of orange, we tend to not really say that these are simple Mendelian genetics, even though the amount of orange might be controlled by as little as a single locus (one pair of alleles / genes), with their own subtleties and multiple variants. I look forward to the hobbyist who comes back with the answers. It requires a lot of test matings but also a lot of data gathering – the numbers are important. Genetic transparency has done some interesting things for Angelfish, and so too, might bring some appreciation for a fish species that breeds with abandon. Many hobbyists have started down this path; this has been a look at some of the information and speculation out there. Is there a veil (longfin) gene floating around out there in the Convict world? Well…based on the fact that Longfin mutations are pretty common, and a few random photos in the references below, I’d say absolutely yes. We just need some industrious breeders to capitalize on them. Great article and it gets everyone excited about this unknown color mutation.